The term "wolf tree" is often used by foresters to indicate ancient open-grown "relic" oaks that have survived in degraded oak savannas. Open-grown oaks are "indicators" of former oak savannas and provide strong justification for oak savanna restoration work. At Pleasant Valley Conservancy we had (have) large numbers of open-grown oaks. 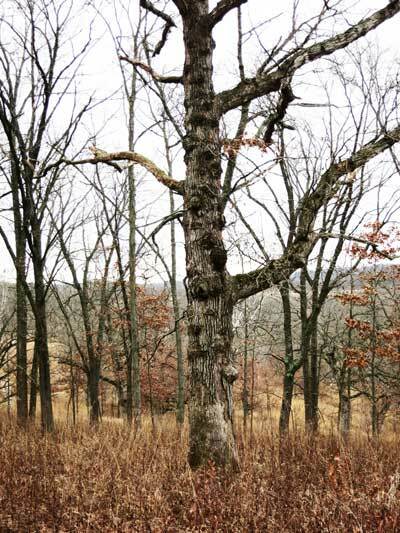 These oaks survived through generations of agricultural activity and are still present in our restored savanna. 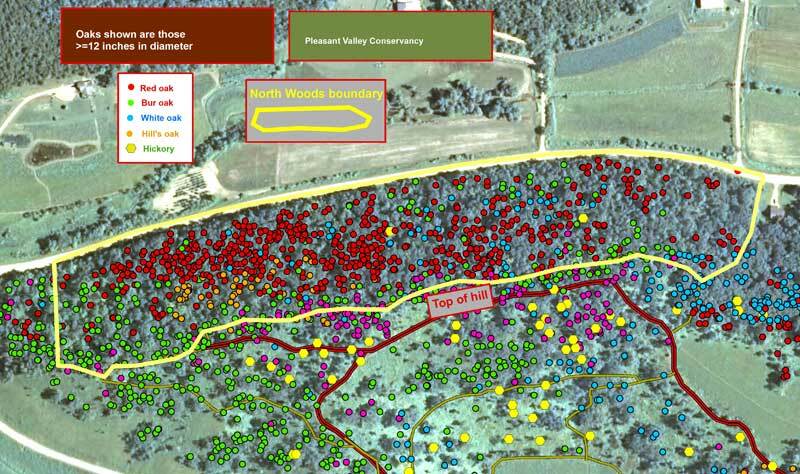 What happens when land containing one or more open-grown oaks is neglected? Without fire, and without brush/tree clearing, the land surrounding these oaks gradually turns into a dense forest of brush and invasive trees. The open-grown oaks become crowded and their lower branches shaded. Depending on how long the former savanna is neglected, the oaks may be seriously damaged, although perhaps still struggling along. Yesterday, while doing the annual Audubon Christmas Bird Count, I spied a "wolf" tree (white oak) that I had overlooked. In summer, with so much greenery around, such a tree does not stand out, but in winter cover it is very obvious. As the photo shows, this venerable tree is covered with gnarled remains of branches that had been shaded and killed. A few branches still remain, although some of these are probably dead also. This tree is easy to find, especially this time of year. In the background of the photo is Toby's Prairie, and the service road is just to the north. I'm not sure why I missed this tree earlier, but it stands out well today. This tree is in the middle of an area that was classified as "stump pasture" in the 1938 Wisconsin Land Use Inventory. 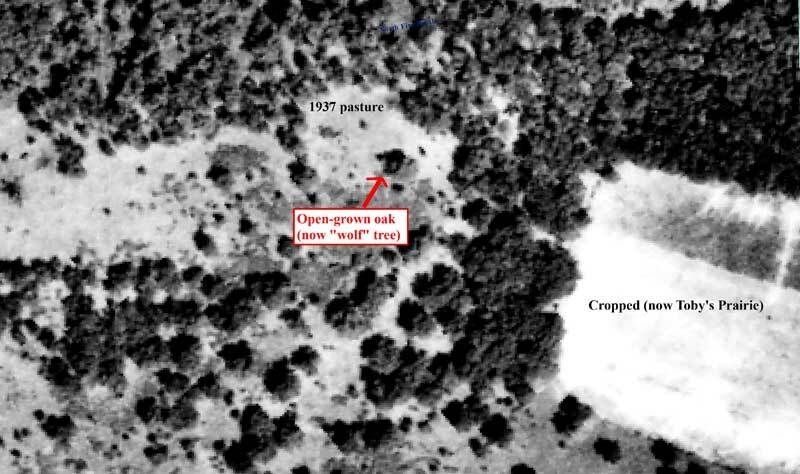 This tree stands out clearly in the 1937 photo shown below. the tree was classified as "stump pasture". What a great description of an oak savanna! 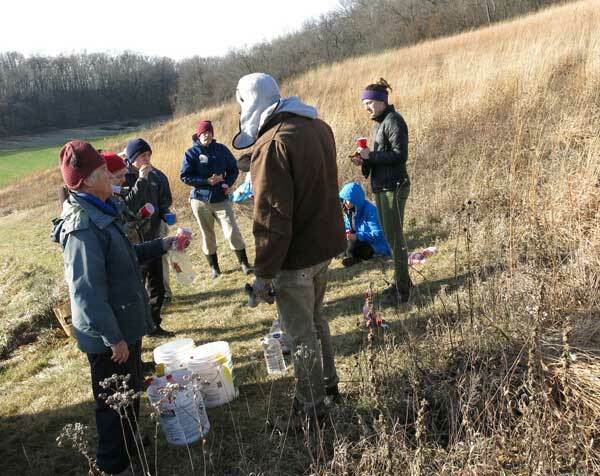 There are three fire consortiums (funded by USFS) that offer educational programs (mainly webinars) of interest to Midwest restoration ecologists. The recentwebinar presented by Greg Nowacki dealing with oak ecosystems was especially interesting. 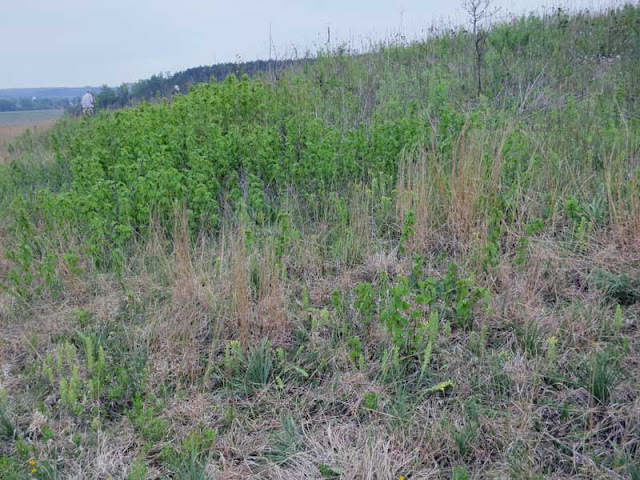 For those who missed the live presentation, the Tallgrass Prairie and Oak Savanna Fire Consortium has just posted an archive version. This version is more than a Power Point, because it allowed for questions from the audience (and answers). Some notworthy scientists were in the audience, including Roger Anderson of Illinois, one of the stalwarts of prairie/savanna ecology. I usually try to watch these live presentations, but had to miss the one on Oct. 15 2015. Yesterday I watched it. Here is the link. Among other things, Nowacki had a very clear presentation of why oak ecosystems are fire dependent. 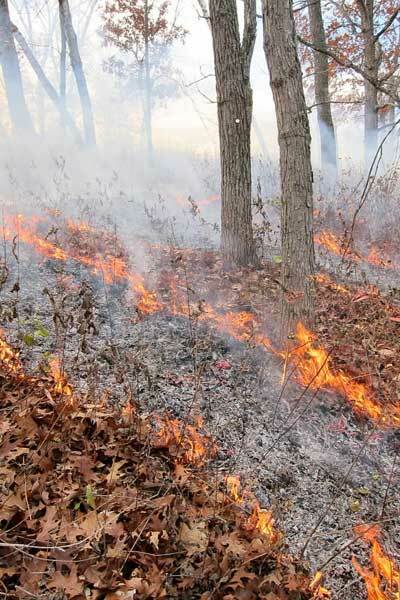 As the photo from our Oct. 29, 2014 burn shows, oaks have thick leaves that fall dry and stay dry. (Double-click to enlarge the photo for better viewing.) They are very rigid and curl up on the forest floor, providing better aeration for burns. Thus oak leaves "carry" a fire very well, providing an excellent fuel bed for a fire. In the 2014 burn, once the black line had been ringed all the way around the woods, we had a number of people with drip torches doing interior lighting. The fire lines show clearly in this photo, and within moments after it was taken, the fire lines coalesced. It took our crew of 19 only 2.5 hours to burn this 30 acre woods. Also, there was little mop-up, since this woods had been burned 5 times in the last 10 years. Other aspects of the fuel characteristics of oak forests that Nowacki discussed: The coarse woody debris from oak logs decays slowly compared with maples and other mesophytic tree species, assuring a build up of woody fuel on the ground. Nowacki also noted that wildlife has coevolved with oak, so that an oak forest is much more beneficial for wildlife than other hardwood forests. Acorns provide an outstanding food value for wildlife ("the ecological equivalent of manna from heaven"). Two days after the Oct. 29 burn, eight deer were seen in our woods, with their heads down eating "roasted" acorns! The year 2014 had been a good "mast year" for red oaks, the principal species in this woods. 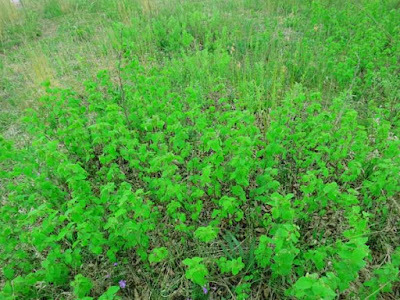 A recent blog post from Chicago about protecting hazel from fire and deer browse brings me to a further discussion of this widespread shrub. Hazel (Corylus americana) is one of those plants that people love until they have it, after which they may discover that it is invasive and nasty, and then they hate it. Why is it sought after? For its wildlife value. Its leaves, twigs, and catkins provide browse for deer and other ungulates. Its nuts are eaten by small mammals, birds, and deer. Beaver eat the bark. In America it has been cultivated as an ornamental since the 18th century. It is also cultivated commercially for its nuts. However, it is an early successional species, which, left unchecked, can destroy native prairies and savannas, making way for dense forests. It is a dominant or co-dominant shrub (understory species) in maple/basswood, jack pine, paper birch, aspen, and northern pin oak communities in northern Wisconsin. It can form extensive thickets in oak savannas in southern Wisconsin. 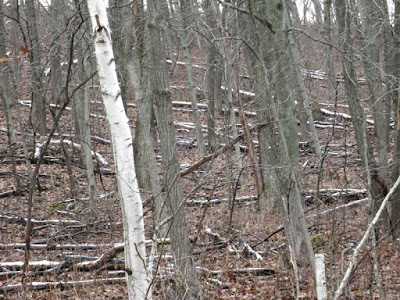 It often competes with hardwoods and pines and because of shading and aggressive growth, it is considered a major deterrent to successful forest regeneration. It is blamed for the failure of red pine regeneration in Minnesota. There has been extensive study on hazel at Minnesota’s Cedar Creek Natural History Area. Hazel can potentially form large shrubs, 3-10 feet tall, and because it is rhizomatous, can form dense thickets. Such thickets were described by early observers in the Midwest. Although hazel is a prolific seed producer, most of the seeds are eaten by animals and birds; the most important mode of reproduction is by rhizomes. After initial establishment of a shrub, extensive aerial stems (root suckers) can form from underground buds. It is shade tolerant and can grow at light intensities of 15% or less. Below a dense hazel stand light intensity may be 2-7% of full sun (Stearns) so that it can crowd out or shade other plants. Competition for moisture is also severe. Hazel is easily top-killed by fire, but it readily resprouts from rhizomes, so that annual burning does not eradicate but actually increases the hazel stem density. However, stems on burned sites are shorter and smaller than those on unburned sites. Where fire is excluded, a heavy density of hazel may develop, greatly suppressing tree growth. Although hazel can be controlled by annual fire, it is never eradicated. Thus, if fire does not occur for a few years, hazel growth may take over and suppress desirable understory plants. Once a dense hazel thicket has developed, satisfactory fire will not be possible due to a lack of fuel. In Black Earth Rettenmund Prairie prairie, whose units have been burned on a two-out-of-three-year cycle for many years, hazel recently began to flourish. Clones with as many as 250 stems develop within a single growing season. (See photos at end of this post.) Because of the stem density, such clones never completely burn, so that eradication of hazel requires the use of herbicide. At Pleasant Valley Conservancy, hazel has been a persistent problem in savannas and prairie edges. Annual fire continuing for at least ten years has not eradicated hazel, although none of the hazel patches are very tall. Only herbicide can control it. A hazel bush is handsome and its leaves are very colorful in the fall. However, if hazel is desired for wildlife, then it must be rigorously controlled. Select choice bushes and eradicate all the rest. Especially in savannas and prairie borders, careful attention to control must be exercised. A three year burn cycle is recommended, two burn years followed by a nonburn year. In the nonburn year, hazel should be surveyed in mid-summer and a few choice bushes should be retained, and all the rest eliminated by herbicide treatment (see below for herbicide use). New spring/summer growth. Canvas the site and spray all plants at the rosette stage with 3% Garlon 3A in water. Small bushes can be treated with 20% Garlon 4 in oil by basal bark any time during the late summer or early fall. Since hazel bushes can easily be found in the fall due to their colorful leaves, this is an excellent time to treat, although it is possible to treat anytime, including winter, but before the following spring burn. Large bushes should be cut with a brushcutter and the cut stems and stumps treated with Garlon 4 by basal bark. Forest W. Stearns 1974. Hazels. In Gen. Tech. Rep. NE-9, Northeastern Forest Experiment Station. Gleason, Henry A. Torreya Vol. 13, August 1913. Over 250 stems were counted in this clone. Also, spreading occurred by rhizome extension. We were blessed with unusually good weather and 12 people turned up for our December work party. We were delighted especially to have three UW Madison undergraduates who found us via email. The whole "party" walked to the South Unit where great progress was made in controlling brush. Yesterday I had an unusual opportunity to see and photograph the downed timber present in our North Woods. There had been a light snow the day before, followed by a slight warming spell. This resulted in the melting of all the snow on the ground, but the snow on tops of downed logs did not melt. Thus, each log lying on the ground was clearly delineated, as the photo shows. Photo taken from County F at approximately the middle of the North Woods. Each log is clearly delineated because of its snow cover. The North Woods at Pleasant Valley Conservancy is a 25+ acre unit that has been generally undisturbed for many years. It consists primarily of red oaks (Quercus rubra), with substantial bur oak (especially at the top of the ridge and at the west end), plus Hill's and white oaks. The map above, based on our tree database. shows the distribution of all the larger trees. 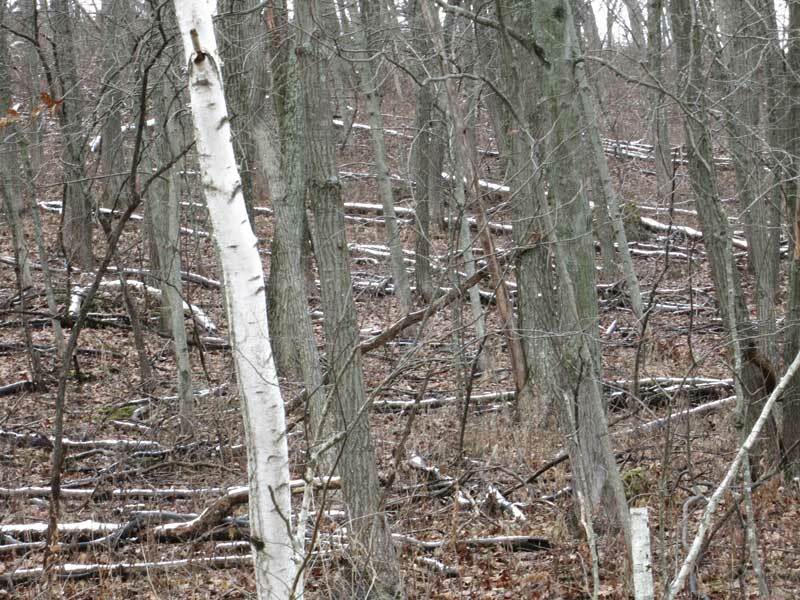 Since management began at PVC about 20 years ago, this woods has been burned occasionally, recently on a 2-year burn interval. For the past three burns (six years) fire has carried very well, with coverage greater than 90%. Therefore, I was surprised to see so much downed timber yesterday, which should have blocked the movement of the fire. It is interesting that almost every log is lying in parallel, horizontal with the slope. Since fire moves uphill, it would appear that its movement would be blocked. My conclusion is that with a substantial oak leaf litter, the flames are high enough so that they are able to skip over the downed logs and keep on moving. In addition, the fire crew was doing extensive internal lighting, thus insuring that the flame front would start anew whenever it gets blocked and dies. This is a major reason why "internal lighting" or use of the "strip headfire technique" is essential when conducting oak woods burns. As I keep reiterating, you can't use your prairie fire techniques when burning oak woods. The question arises as to what is the source of all this downed timber? As the photo shows, most of the logs are of substantial size, although not as large as those standing. Because of the dense canopy (>90% cover), lower branches will be shaded and unable to continue growth. This is the standard "self-pruning" that occurs in a woods. There are probably other factors as well. Oak wood does not decompose very quickly, so that lots of "carbon" ends up being stored on the forest floor. There is now quite a bit of research on carbon storage in woods, as part of climate change research.